Windshield Mount, Caps and Blind Spot! 1707: The small, streamlined die-cast aluminum stems and heads on our Teardrop Mirrors provide a sleek custom appearance while keeping functionality intact thanks to the convex glass that improves rear visibility. The pivot ball and socket provide silky smooth adjustment and secure holding power. The mirror heads measure 5" wide x 2" tall, and the stems position the pivot ball 5" out and 3" above the mounting location. 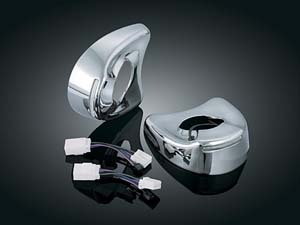 Available in chrome finish, mounting hardware for most applications is included. Fits: Direct replacement for H-D Applications (except Street). 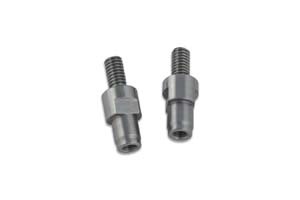 Indian, Metric, Sport Bike & Victory applications require 1411 adapters for installation, sold separately. 1708: Like above but in satin black. Wipe your bars clean with our innovative Windshield Mounted Mirrors. 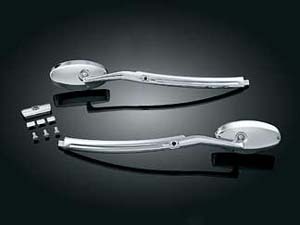 Sleek design blends a classy chrome windshield accent strip with gracefully curved arms to support the mirror heads. 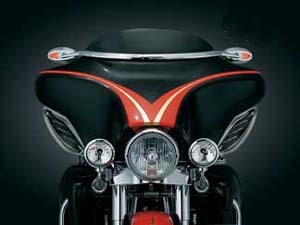 Our convex glass Turn Signal or Ellipse Mirror heads are positioned just above the upper edge of the fairing to provide great rearward visibility. 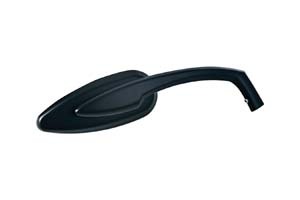 Choose Turn Signal Mirror heads and you'll add auxiliary forward facing running and turn signals. 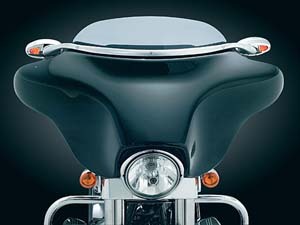 WTM-03: Windshield Mounted Blind Spot Mirrors (set) Fits: '96 to '13 Electra Glides, Street Glides, & Trikes. 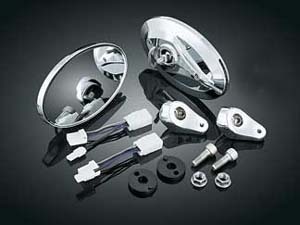 WMM-54: Allows installation of Blind Spot Turn Signal Mirror Heads or any mirror with 1/4"-20 threaded stud. WMM-55: Set of 3 replacement snap caps. Fits: '96-'10 Electra Glides, Street Glides, & Trikes. 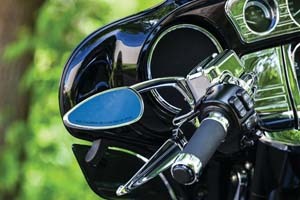 Wipe your bars clean with our innovative windshield mounted mirrors. 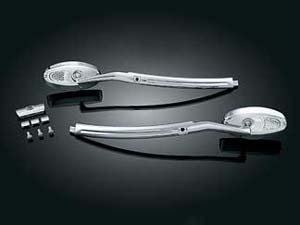 Sleek design blends a classy chrome windshield accent strip with gracefully curved arms to support the mirror heads. 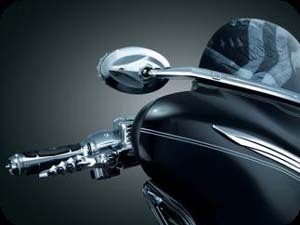 Turn Signal or Ellipse mirror heads are positioned just above the upper edge of the fairing to provide great rearward visibility. 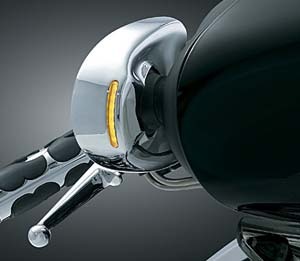 Choose Turn Signal Mirror heads and you’ll add auxiliary forward facing running and turn signals. Why keep your mirrors camouflaged within your fairing? Add our new Mirror Caps and highlight those great lines by adding a sparkle of chrome in an unexpected location. 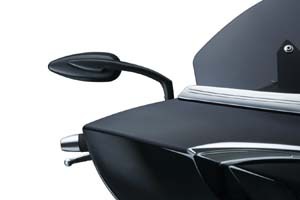 BS-56 Blind Spot Mirror w/Inner Fairing Mounts: Utilizing our new blind spot directed turn signal mirror head with a cleverly designed mount, Kuryakyn offers you an awesome combination of looks and function. 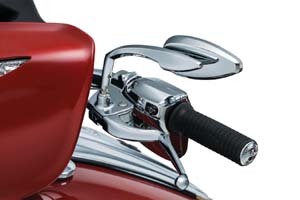 The mirror heads and mounts are beautifully chromed and provide excellent rearward visibility. 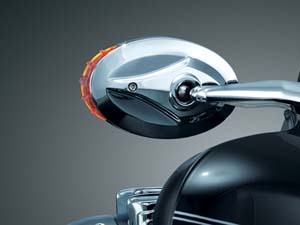 Amber LED’s in the outer edge of the mirror function as auxiliary turn signals and plug into the stock wiring harness. These mirrors are direct replacements for those found on the ’06-’08 FLHX or they can be installed on any ’96-‘08 FLHT, FLHTC, or FLHTCU. They utilize existing holes in the inner fairing on FLHX models, but require drilling for installation on FLHT models. They include a convenient template and all necessary hardware. BS-35: Blind Sport Turn Signal Mirrors. Alert drivers around you of your intention to move! These classy mirrors have an L.E.D. Amber turn signal directed to the side to get the attention of those drivers in your "blind spot." 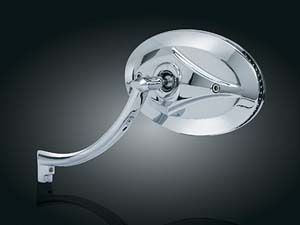 The flat glass has a beveled edge and a sculpted mirror head that moves like silk in a ball and socket mechanism. 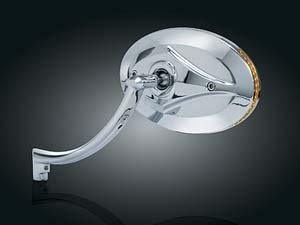 BS-57: Blind Sport Turn Signal Mirror Heads (pair). Intended to be used with our WMM-54 on other stems. 1411: Indian: All '15 Indian Scout models & All '14-'15 Indian models for installation of mirrors or universal mirrors that extend straight up 1-1/4" for clearance from brake master cylinder. Victory: All Victory models (except Vision). 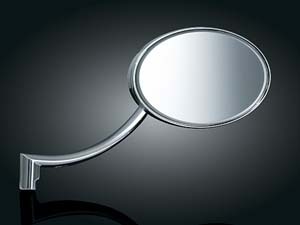 Adapts to install mirrors with a threaded 5/16"-18 Hole.